Search our website, photo library, current publications and items in our recent Bulletins. For an exact match to a phrase, use "" (eg "Morden Park" or "Morden Hall Park"). Use Stem searches (eg liqu will find liquid, liquor, liquors, Liquorice and liquidation). 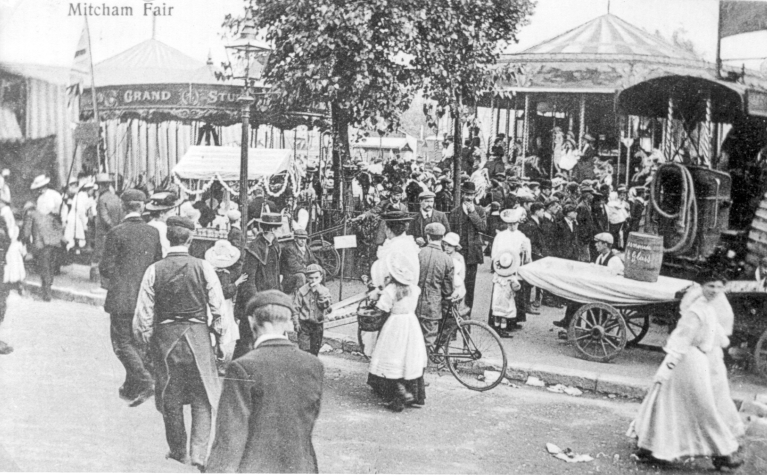 The Fair Green, Mitcham, is the commonly used alternative name for the Upper Green and derives its name from the fair which was held there on 12th-14th August each year until 1924. There is a common belief, unsubstantiated by documentary evidence, that Mitcham Fair was established under a charter granted by Queen Elizabeth I. Although it could well have originated as a Tudor fair, the first documentary evidence of its existence is found in 1732 when an inquest was recorded on an itinerant fiddler who died in a local house. In the 18th and 19th centuries gypsies and tinkers frequently came to Mitcham for the Fair and remained in their caravans and tents on the Common doing casual labouring in the many local physic gardens. The fair steadily grew in size during the late 19th and early 20th centuries with the usual fairground attractions, many later becoming steam-powered. Each year the fair created traffic problems whilst at the Fair Green and so in 1925 Mitcham Urban District Council moved it to nearby common land, the Three Kings Piece. After closure in 1974, the fair was re-commenced in 1983 and continues to this day usually lasting for about 10 days and commencing about 12th August. Copyright © 2019 MERTON HISTORICAL SOCIETY. All Rights Reserved. Minimize by Slocum Studio	. Web development by Claridge Associates.